I love it when we have extra cardboard lying around the house! 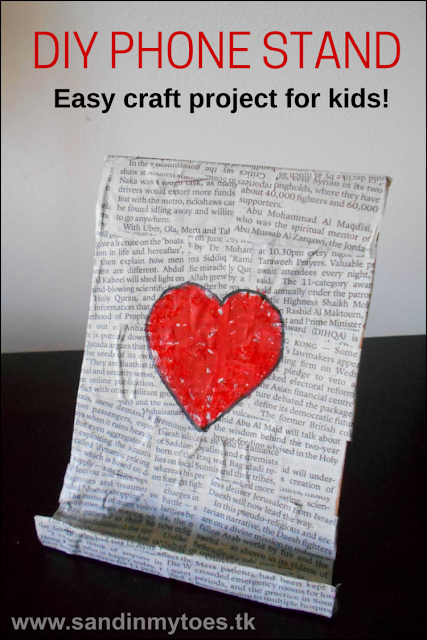 The material is so durable that you can make almost anything you set your heart to. So, we made this very simple Phone Stand that actually functions as one. It was a gift for Dad on Father's Day, but kids can also make it for themselves or a friend. It's a fun craft project which they can design and personalize any way they want. 1. 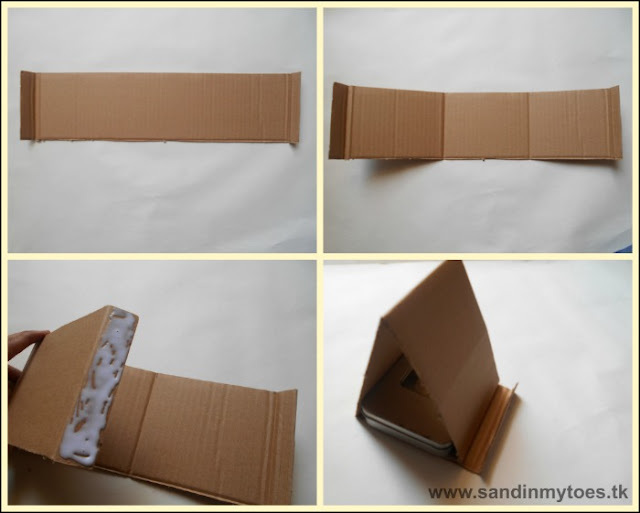 Use a strip of cardboard 43 cm long and 10.5 cm wide. This should fit most phones. 2. Fold the edges at both ends, about 2 cm. 3. Starting from the left, fold at 12.5 cm (excluding the 2 cm fold), and 13 cm after that, and 14 cm next. 4. Put glue on the fold on the extreme right and bring it down as shown in the photo. Leave about 2 cm space to hold the phone. You might want to put some weight over the glued end to make it really stay. 5. Now, make a mixture of equal parts white glue and water, and use a brush to apply over the exterior of the stand. 6. 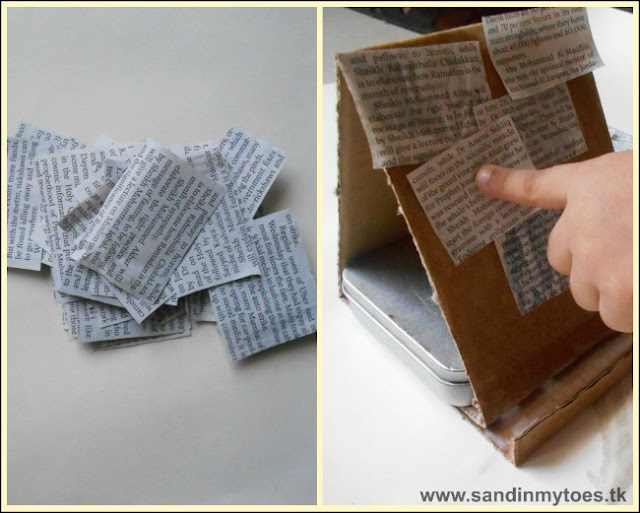 Cut out a few squares from newspapers and glue them on using the mixture. After you've covered the whole area, apply the mixture over it again, and let it dry completely. 7. 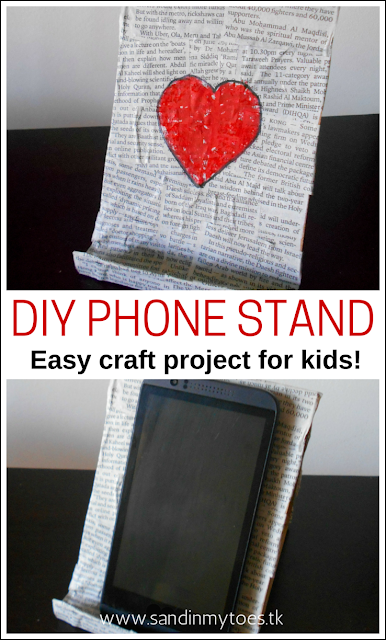 Decorate the phone stand any way you like. We liked the newsprint, so we just drew a heart in the middle. You could also paint over it, and use stickers. You could even personalize it with photos, or a special message. Lovely idea for a gift. I love the newspaper design. I'm always looking for mine too! Glad you liked it, it was fun to make too! Absolutely, we always aim for hand made gifts within the family. Thank you, I'm glad it turned out as I visualized it! This is a fabulous idea! I'd love to do it with quotes of poetry. Love this! What a creative Father's Day gift idea!! Thanks for linking up on #ToddlerFunFriday!